Here are noteworthy Valley organizations that support veterans and active service members throughout the year. In big cities and small towns across America each November, we pay homage to veterans, military heroes and active service members. Once the parades are over, most Americans return to their daily lives, with little attention paid to veterans and their families until the next parade. No one organization can meet all needs for the entire military and veteran population, according to Goodwill of Central Arizona. Below are some noteworthy Valley organizations that support active and former military service members year round. From raising awareness of veteran homelessness to reducing veteran suicides to supporting veterans’ needs with financial services and loans, these organizations make a positive contribution to the lives of veterans and their families. AmTrust Bank in Phoenix, a division of New York Community Bank, believes that giving back is an essential part of being a good corporate neighbor. Giving back takes various forms, starting with financial services. AmTrust offers exclusive military checking accounts for active and former military personnel, including discounts and fee waivers on a variety of services, as well as the ability to earn additional interest on new CDs. Serving our country for more than 40 years, Employer Support of the Guard and Reserve (ESGR) fosters a culture in which all employers support and value the employment and military service of members of the National Guard and Reserve. ESGR meets the needs of Guard and Reserve members, their families, and America’s employers by joining forces with a network of other national, state and local government and professional trade organizations. As a community organization, Goodwill of Central Arizona is committed to providing the best care and support to all those who serve. The organization seeks to build a continuum of care that addresses the needs of the entire military, veteran and family population. Be sure to save the date for Goodwill’s 8th annual statewide symposium in support of service members, veterans and their families. Homes for Heroes provides extraordinary services and savings to local military veterans when buying or selling a home. With a dedicated mission to give back to those who have selflessly served our country, the organization also gives back to those who serve our community on a daily basis, including teachers, firefighters, police and health care professionals. 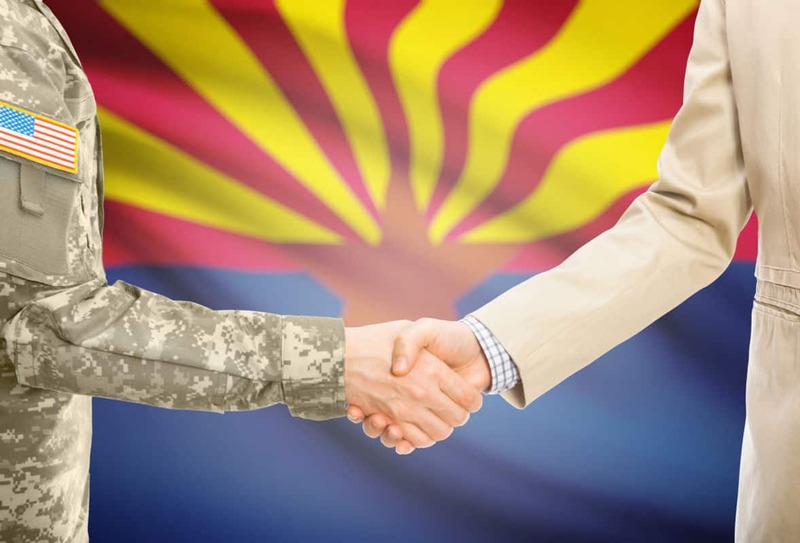 S.E.E.4Vets collaborates with Arizona community colleges to shape, fund and implement tutoring-type programs to improve student veteran retention and inspire these veterans to persist and advance in their school academic work. In addition, the organization provides student veteran-employer business connections to promote the unique and specific talents former service members bring to the workplace. Honor, integrity and service are the fundamental ideals fostered within the military—and the traits Sonora Quest Laboratories (SQL) looks for when hiring candidates. Throughout the years, SQL has proudly participated at local military hiring events and works with www.military.com to promote positions to attract veterans. The Southwest Veterans Chamber of Commerce is a nonprofit organization whose mission is to improve business opportunities and enhance the economic environment of veterans, veteran-owned businesses and veteran-supportive businesses in the Southwestern United States. Through housing, counseling, employment and other support services, U.S.VETS – Phoenix helps homeless and at-risk veterans and their families’ transition successfully to civilian lives. The organization provides housing to 900 veterans and places more than 250 vets into jobs each year. More than 400 local veterans and their family members receive other services to help them regain and maintain independence. In addition, this dedicated organization serves 95,000 meals to homeless veterans annually. Vets’ Community Connections (VCC) is a community-based initiative designed to involve a greater number of individuals in veteran reintegration efforts. Its mission is based on a simple premise: the most effective way Americans with good will, but limited time, can support veterans is to talk to them; give them information and advice about the community, and help build the community networks that veterans and their families are looking for. VCC, which launches on Nov. 14 in Maricopa County, will enable community residents to use their experience and expertise to give veterans/military and their families the answers to a host of questions that fall outside the realm of traditional veteran service organizations.